Our primary goal as chiropractors is to decrease our patient’s pain and discomfort while improving their ability to achieve their daily activities. Symptoms such as pain and loss of function are usually proceeded by subtle, yet important clues. Early recognition of these warning signs are vital to recovering within the shortest amount of time. Other factors such as proper nutrition, exercise, both work and sleep habits also play an important role in recovery. This is achieved through specific chiropractic adjustments of the involved vertebra and may, at times, be followed by therapies such as traction, heat and ice. 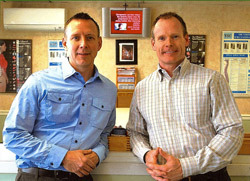 Becker Chiropractic prides itself on personalized care, specific to each of our patient’s needs. I am impressed that you and your staff go above and beyond to educate your patience on the worth and logic of chiropractic care vs medical physician care. Thanks, and keep up the good work. Dr. Tom Becker is a 1989 Palmer College of Chiropractic Graduate and Dr. Brian Becker is a 1995 Palmer College of Chiropractic Graduate. Dr. Tom Becker is married with 2 children and Dr. Brian Becker is married with 4 children. Thanks for visiting our site. We look forward to meeting you in person and learning how we may be of service to you. Give our Lemoyne chiropractic practice a call and let’s arrange a time to explore your options.